As has been announced, the Canadian government will no longer be making pennies. It makes perfect economic sense—it costs 1.6 Canadians cents to mine and manufacture the copper into pennies, it was very much a drain on the Canadian government’s finances. and people have found pennies to be a nuisance. Essentially the Canadian government will still be accepting pennies, and all purchases will be rounded off to either five cents (nickel) or zero. The method of replacing pennies will not be perfect, but it makes sense (no pun intended). In the long-run the Canadian government will be much better off without its penny. 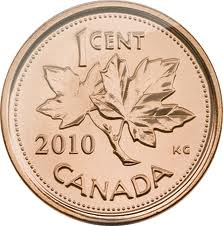 And with the cost of living in Canada being what it is, the Canadian penny is too low a denomination to even be considered now. How very different from what the United States is doing. Twice the U.S. government has tried to phase out the American penny, and as you guessed the U.S. Congress has failed both times. In 2002 and 2006, then U.S. House Representative James Kolbe (Republican-Arizona) introduced two bills to eliminate the U.S. penny. Both bills died when the Congress adjourned, and since then no one has even remotely taken up the challenge of getting rid of the U.S. penny. There are three main reasons why the U.S. penny will be with us for a good while longer. First as many people have guessed is congressional inertia. One just cannot get any congressional officials in either the U.S. House of representatives or the U.S. Senate to even consider a bill to eliminate the U.S. penny. A second reason is the copper mining industry. Unlike Canada, the major copper mining corporations in this country have a great deal of influence over the Congress and indeed over leading American businesses. They want the U.S. penny to stay alive because it gives them billions of dollars in subsidies they would not otherwise have. The third reason is because of, ironically, sentimentality among numismatists (coin collectors). The penny has been a mainstay of this country since 1792, and there are years where less U.S. pennies are produced than others. Strangely enough, because there might be that “rare” penny in the piggy bank, numismatists look for that one year that might fetch a few dollars or more. If all of this sounds strange as to why the United States may keep the penny, it is a fact of life. What is also a fact of life is that it costs the United States 2.4 cents for every penny we make. The production of pennies, even in this bad economy, is a waste and is wasting money at a time when the U.S. government should be saving every bit of money from needless and wasteful production. In my book the U.S. penny counts as a truly needless waste that should be considered.